Believe it or not, basil actually enhances the natural flavor of watermelon. You can choose to either blend the soaked and plumped goji berries into the final drink, or leave them whole as juicy little morsels. 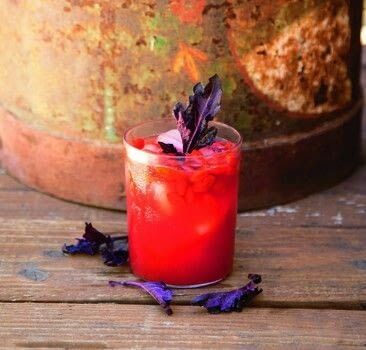 Use purple basil instead of the green variety to produce an even more stunning red color in the juice—and take advantage of its heart-healthy anthocyanin antioxidants. Look for purple basil during the warm months at farmers’ markets, or grow it at home in your herb pot! Posted by GMC Group • Published 17th August 2014 • See GMC Group's 291 projects » © 2019 Julie Morris / Sterling · Reproduced with permission. Juice the watermelon and basil. Add the goji berries, mix well, and let the berries steep for 15 minutes until they’re saturated with juice. Juice may be blended to fully incorporate the goji berries, or enjoyed as is, with the plump goji berries adding a lovely textural addition.